Location: Hurst Point, Milford on Sea, Hampshire, England. Notes: Hurst Castle in Hampshire on the south coast of England is one of Henry VIII's Device Forts, built at the end of a long shingle spit at the west end of the Solent to guard the approaches to Southampton. Hurst Castle was sited at the narrow entrance to the Solent where the ebb and flow of the tides creates strong currents, putting would-be invaders at its mercy. Also known as a Henrician Castle, Hurst was built as part of Henry's chain of coastal defences to protect England during the turbulent times of his reign. Charles I was imprisoned here in 1648 before being taken to London to his trial and execution. The fort was modified throughout the 19th century, and two large wing batteries were built to house heavy guns. It was fortified again in World War II and then decommissioned. It is now owned by English Heritage and is open to the public. 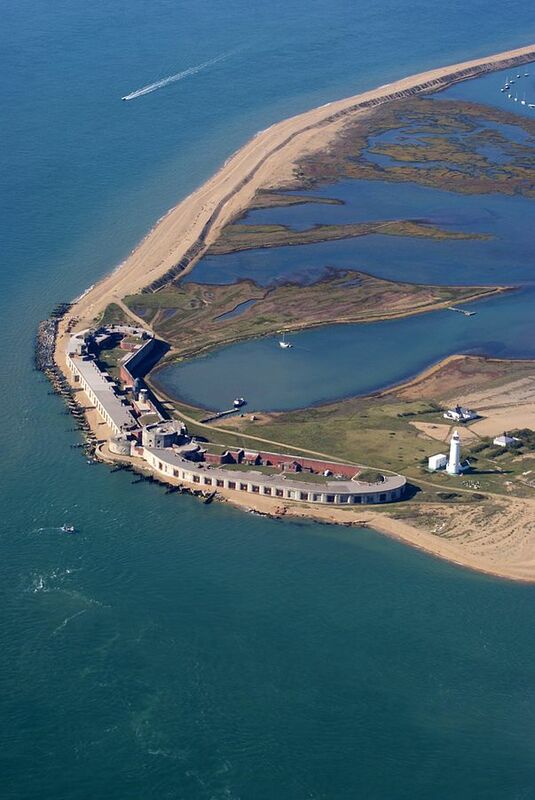 Hurst Castle - official site, details of opening times, the ferries, history, etc.